For awhile now, I've been aware of the existence of a Yoga Instructor Collective Unconscious. It the phenomenon of different instructors in different studios/gyms/spas/what-have-you all working on the same pose/body part/flow/transition within the same week or couple of days. Now, I'm not talking about everyone doing Warrior II; that's a given. I mean the non-standards; the things instructors don't always do from week to week. Then one week you go to your (different) classes, and everyone is working on the same thing. Well, it seems that there is a similar phenomenon amongst food bloggers. At least I've noticed it within this sort of specific food niche. 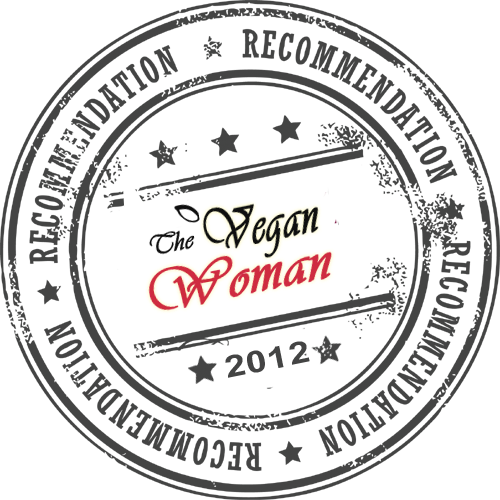 You know, Vegan; Gluten Free; Vegan AND Gluten Free; Raw/Whole Foods... you get the picture. Today, I lined up my photos and prepared to post a rather successful lasagna experiment, when what did I see in one of my networking feeds?? 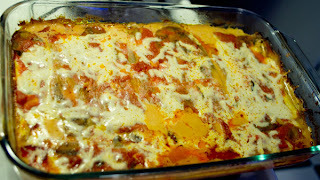 - Yep; a recipe post for GF lasagna. Funny! Well, I decided to post anyway. 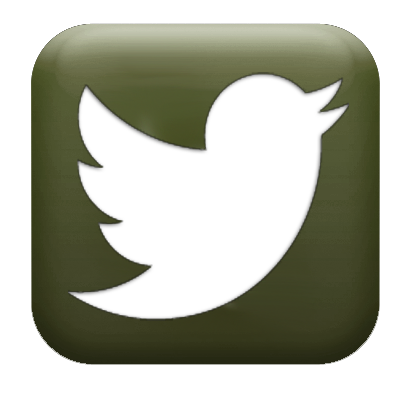 I defy you, Food Blogger Collective Unconscious! 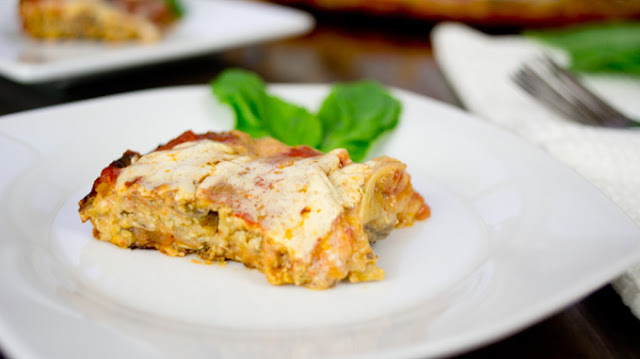 This lasagna is not only Vegan and Gluten Free but also Grain Free, Soy Free, Nut Free, and Corn Free. Yes. Those aren't typos. It's SO very allergy-friendly. The Pumpkin Seed Pesto adds a nice flavor profile; however, if you're not into it, or can't tolerate seeds, it can be omitted without sacrificing any deliciousness whatsoever. 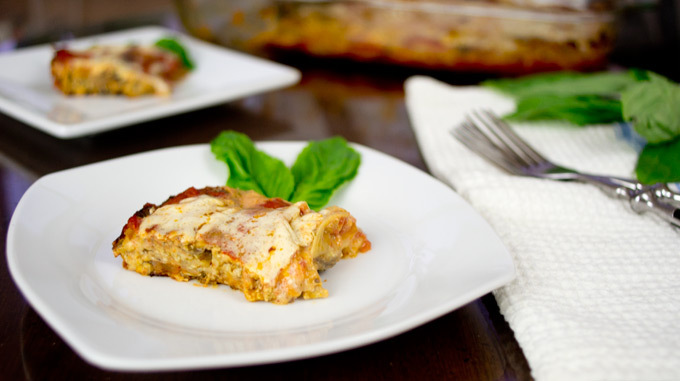 This lasagna is easiest to prepare, if you own a mandoline. It's not recipe-buster, if not, but I do highly suggest making the small investment. It's truly indispensable, if you prepare a lot of raw foods but also if you don't. I own this one, and I absolutely love it; it even comes with it's own convenient storage case. Back to lasagna, though... I've made this before (quite successfully) using a tofu ricotta, but I wanted to come up with a soy free recipe. It's a bit different, and I'm so happy to say, it turned out very well. The BFF ate nearly half of the pan. He then took the rest home, ate some as a late night snack, and ate the rest for lunch today. 45 oz (3 - 15 oz cans, or home-cooked) Canellini or White Butter Beans - I used a combination of both. Start5 your sugo (sauce), and let it cook, while prepping the other ingredients - don't forget to stir it periodically. In a food processor, combine (drained) beans, nutritional yeast, parsley, and a few pinches of sea salt. Process until the mixture is relatively smooth. Some texture might be nice, but you don't want whole beans lurking about. Set the mixture aside. If you're including the Pumpkin Seed Pesto, prepare that as well, and set aside. Cut the top and bottom off of the eggplants (be frugal) and peel them. I found a sharp knife worked best to peel them, but however is most comfortable for you, go for it. Slice the eggplants on the thinnest setting of the mandoline - mine says "extra thin slices". It will be easiest to get even slices holding the eggplant in your hand. As the eggplant becomes thinner, please use caution, and use the grip handle. No mandoline? No worries. Using a sharp knife, slice the eggplant into 1/8" slices, as evenly as possible. Overlap the eggplant slightly, to avoid gaps. Once your eggplant is sliced. Gather your ingredients and a 9"x13" baking dish, and begin to assemble your lasagna. 1. 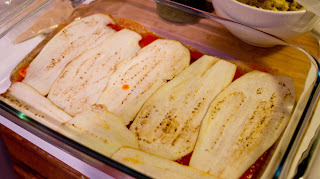 Layer the eggplant slices, overlapping slightly to avoid any gaps or holes. 2. Spread an even layer of the white bean "ricotta" over the eggplant. You may need to get creative because the the "ricotta" is thick, but attempting to spread with any pressure, will cause your eggplant to slide out of place. 3. Spoon a couple of tablespoons of the Pumpkin Seed Pesto onto the "ricotta", and use the back of a spoon to gently swirl the pesto in, until it's distributed pretty evenly across the pan. Adding this actually helped to make the "ricotta" easier to spread. 4. 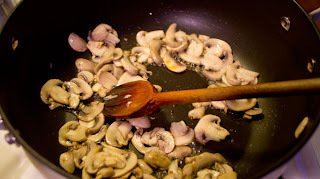 Add a layer of mushrooms, and approx. 1/4 of the Daiya, if you're using it. 5. 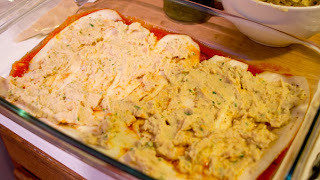 Gently spread a thin layer of sauce over the top, making sure to cover all the way to the edges. Repeat steps 1-5 with the remaining layers. You should end up with three to four layers. Once you've completed the final layer. Cover it with one last layer of eggplant. Spread sauce over the eggplant - you can be more generous here - making sure to cover all the way to the edges. Sprinkle some Daiya over the top OR swirl a bit of Pumpkin Seed Pesto OR sprinkle a bit of nutritional yeast. Cover with foil, taking care not to let the foil come in contact with the top layer. Bake in a 350F oven for 45 minutes to 1 hour, or until the eggplant is tender and the lasagna is bubbling. Allow the lasagna to cool for 15-20 minutes before serving. Combine pumpkin seeds, basil, and garlic in a food processor or mini blender. Pulse until the everything is evenly chopped. Add the olive oil and a pinch of salt, and continue to blend until the consistency is even, scraping down the sides of the food processor, if necessary. I usually add spinach, whenever I make lasagna, but I wasn't sure how the bean "ricotta" would turn out, so I wanted to keep the additional ingredients to a minimum. Since the lasagna was a success, spinach is definitely going in next time. It will also add more "definition" to the layers and make a taller lasagna. If you're into spinach, feel free to add 8-10 oz of chopped, cooked spinach; make sure to remove any excess water, and layer it with the mushrooms. Also... as I was typing this, I had another idea. The bean "ricotta" is delicious, but it's closer to the consistency of a bean spread. I was thinking that steamed cauliflower might help. Maybe it seems weird, but go with me on this one. I used cauliflower to make a nut-free "ricotta" in my raw lasagna7, and it worked out really well. My thought is to add 1-2 cups of steamed cauliflower to the beans after they've been pureed/pulverized, and then gently pulse until the cauliflower is chopped but still retains a little bit texture. 2. I try to stay connected. 3. There were seriously four other recipes on the day I had planned to post. 4. It's just all sorts of crazy here today. 5. Unless, of course, you're using sauce from a jar. 6. The extra liquid would be welcome, if making a lasagna using a regular GF noodle; not so much for the eggplant "noodles". 7. I'll be posting that one as well! I normally don't post comments before I actually try a recipe, but I just can't help it. This looks delicious, and I'm totally going to make it in 2 weeks (when I get back from vacation). I haven't tried this recipe yet, but was in tears when I saw it. I recently learned that my 18 month old son is allergic to all nuts, wheat, oats, rice, soy, eggs, dairy and even though corn is not on the restricted list, I've limited it as well. It has been such a challenge to find recipes that meet all of those requirements. I can't use the Daiya cheese and will have to substitute the coconut oil but can't wait to give it a try and definitely will add spinach. Thanks so much. I hope the recipe works out for you :-) There's no coconut oil in the recipe; however, there is coconut oil in the Daiya, so if you omit the Daiya, you should be good to go! 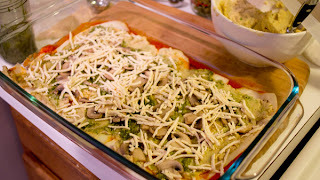 My recipe in So Delicious' SO Much to Love Giveaway! Content of cucinalibera.com is licensed under a Creative Commons Attribution-NonCommercial-NoDerivs 3.0 Unported License.